Hola, friends and feliz Friday! It’s time for another post in my A Blogger’s Dozen series!! Today’s guest blogger is Holly from Noisette. This is the part where I would normally write about how lovely and sweet Holly is, and talk up her inventive and delicioso food blog. However, she wrote the cutest introduction herself, so I’m just going paste it for you all. You guys will seriously become enamorado with Holly’s cooking and personality, and not just this Mexican-inspired meal which has me speaking Spanish. Make sure you visita her blog, pronto! Arriba! Hello, I’m Holly and welcome to my guest post here on Hello, Scarlett. 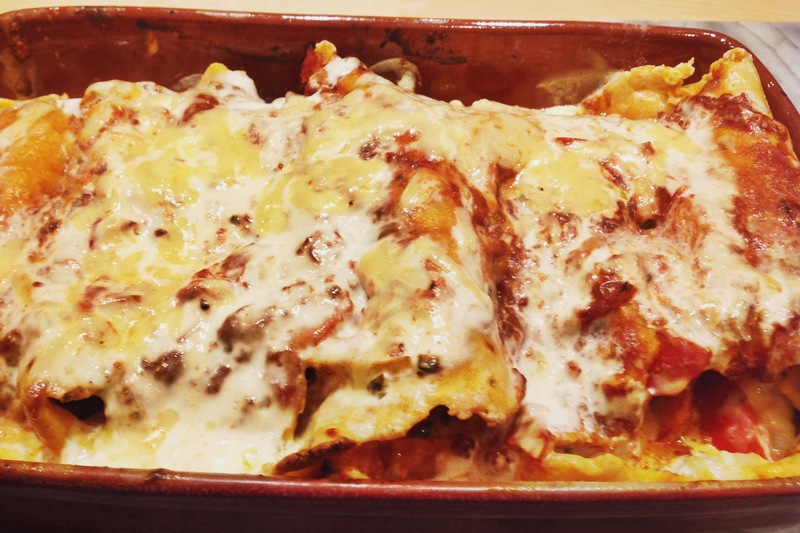 I can’t even begin to say how excited I am to be here and that I hope you enjoy this recipe. I had great fun creating it and even more fun eating it! 1. The Sauce. Begin by making the sauce. This gives it plenty of time to reduce and the flavours to deepen. Do this by emptying the tins of tomatoes into a medium saucepan; add the chopped tomatoes, chili flakes, cayenne, salt, paprika, liquid smoke and garlic. Leave this to bubble away on a medium heat, stir occasionally. 2. The filling. 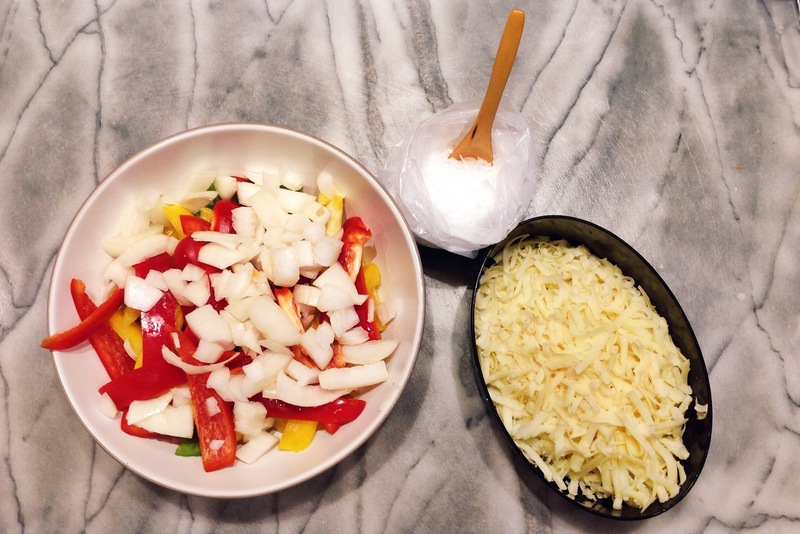 If you haven’t already, chop the peppers and onions and set aside in a bowl. 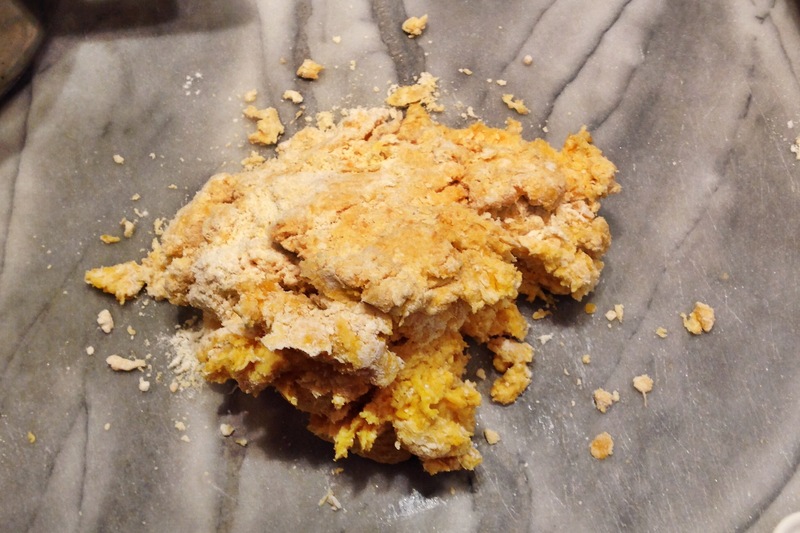 Make sure your cheese is grated and your chicken chopped. Heat some olive oil in a frying pan and sauté the chicken until it begins to turn golden brown, it doesn’t matter if it isn’t completely cooked as it’ll be going in the oven. Set aside in the pan. 3. The tortillas. 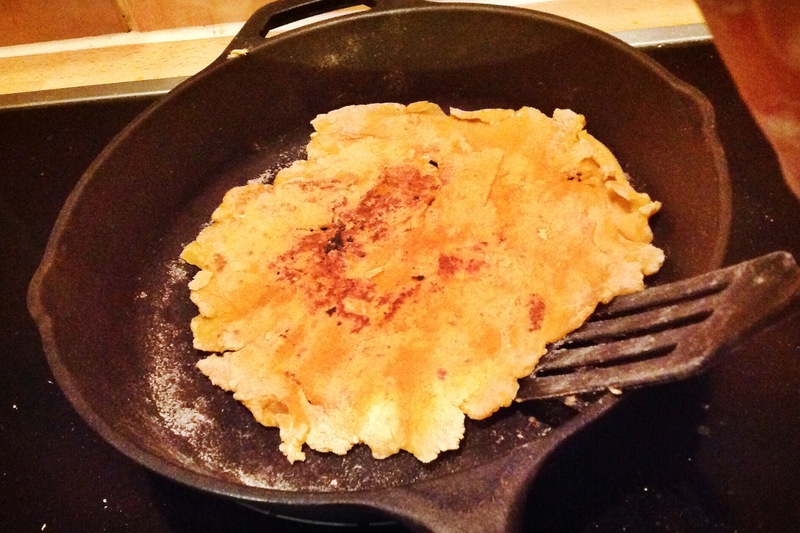 Now these can be difficult to handle but my tips are to keep flouring everything and to use a spatula and rolling pin to persuade your tortilla off the work surface. 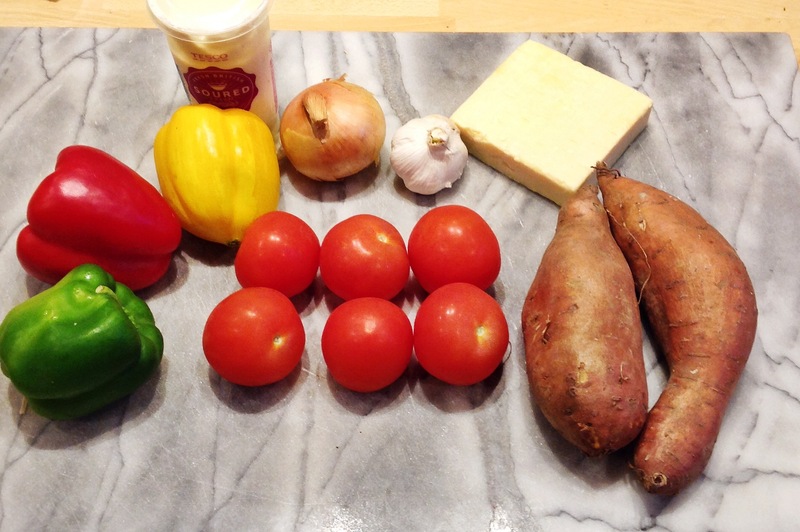 Boil the chopped sweet potato until cooked, 10-15 minutes in a medium saucepan. Drain and mash the sweet potato and then add the olive oil, flour, salt and xantham gum, stir the ingredients with a wooden spoon until they make a rough dough. This requires some elbow grease and will take a little time. 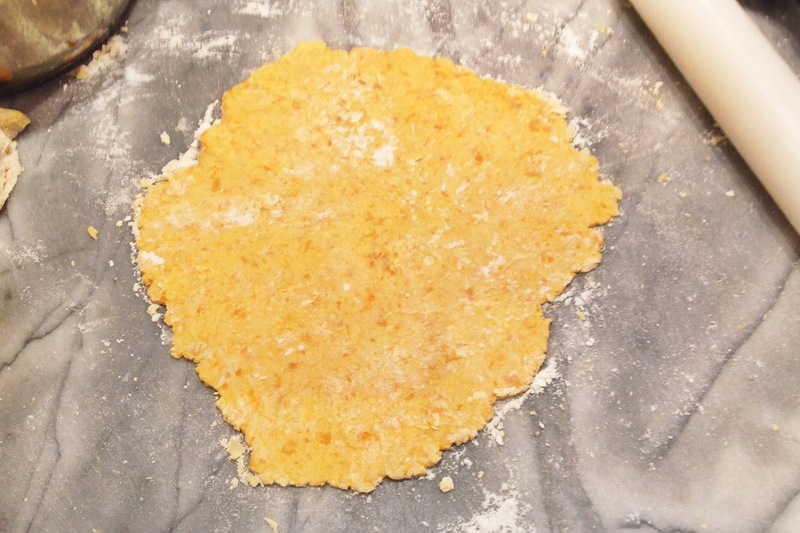 Add more flour if too sticky (but make sure you’ve incorporated all the flour first) or more olive oil if too dry. Place a cast iron skillet or heavy bottomed pan onto a medium heat (with no oil). 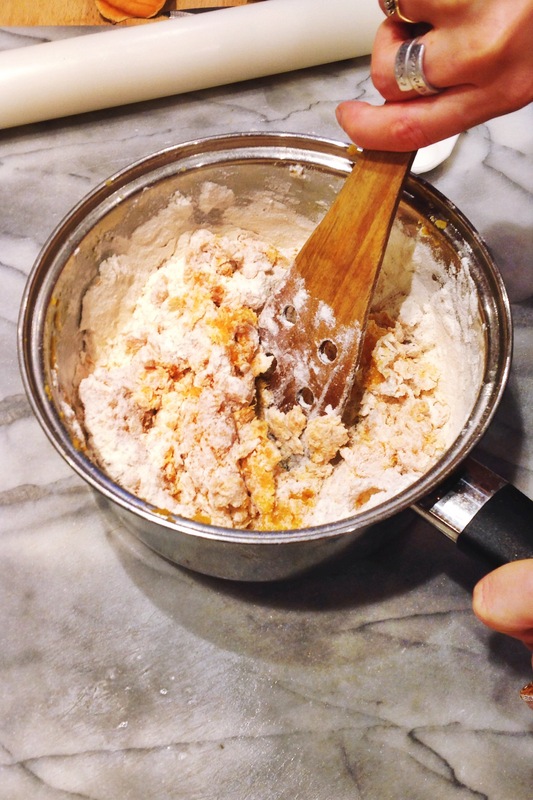 Tip the dough out onto a floured work surface and knead it with your hands until it forms a ball. Flatten the ball slightly and top with flour. Split the ball into 6 and then repeat the step above, i.e. 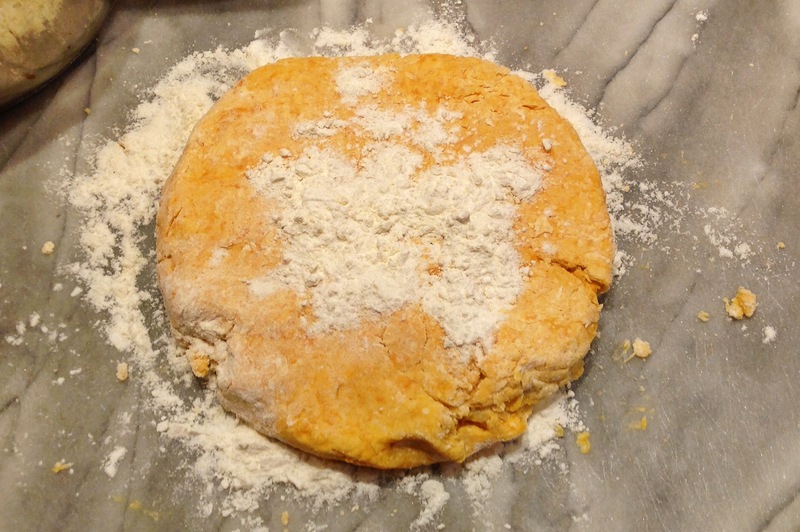 roll the dough into a ball and flatten slightly on a floured surface. Flour the top of the dough and roll into a thin circle, approximately 3 mm thick. I found rolling slightly then flipping over and repeating an effective way of preventing the tortilla from sticking. Pick the tortilla up off of the work surface and lay it over a rolling pin (optional, but I found it will help to move it in one piece) and then transfer it carefully to the hot skillet. 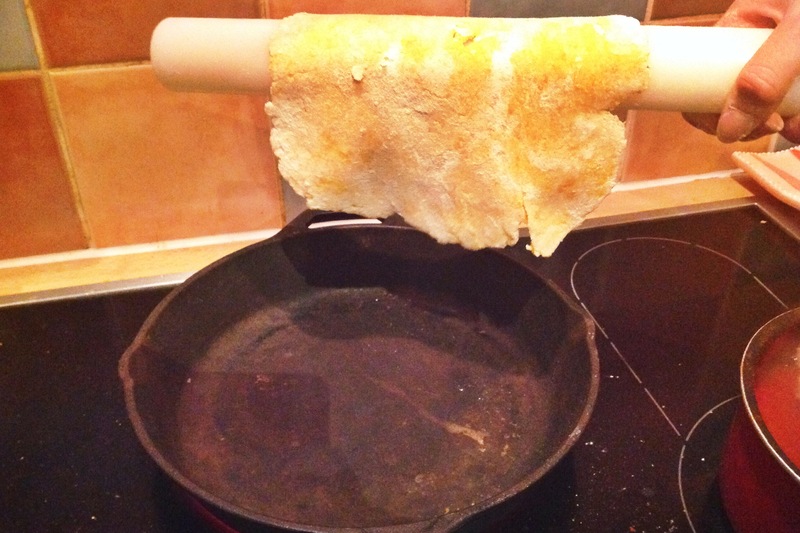 I found rolling it onto my flat hand and then gently laying it in the pan (careful not to burn your fingers) the easiest way. Don’t be disheartened if your first one sticks to everything, roll it back into a ball and start again. Let them cook for a minute or two on each side (flip with a spatula), until they begin to colour and crisp up. Pile them up on a plate as you go along. Once all the tortillas are cooked, place half the sauce in frying pan with the chicken and reheat, until boiling and then remove from the heat once it has begun to reduce. I like the peppers and onion to be a little crunchy and as such put them in the tortillas raw; if you’d rather, you can cook them in the sauce with the chicken before using them in the filling. 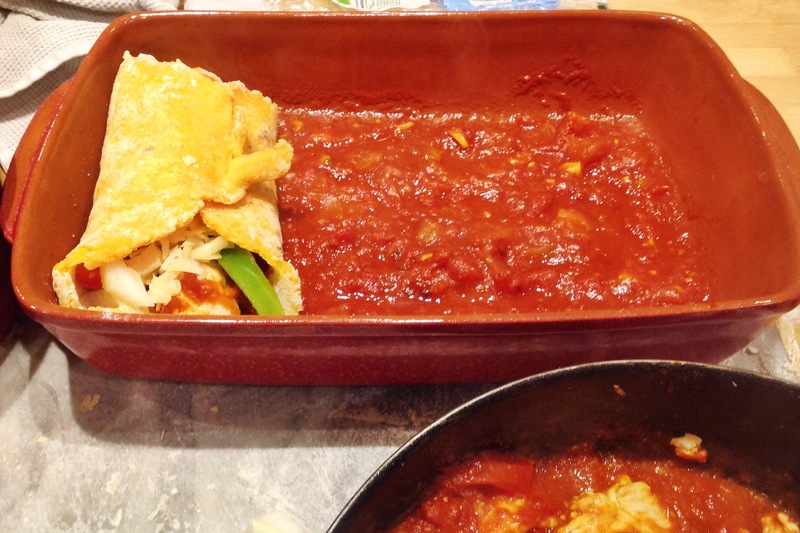 Pour half the remaining sauce into the bottom of an oven proof dish, such as a lasagne dish. 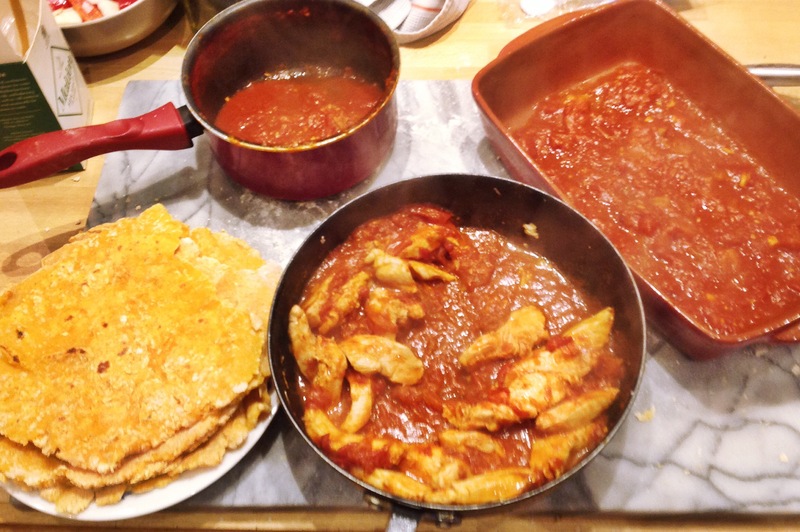 Make sure you’ve got the chicken, dish, tortillas, peppers, onion and grated cheese nearby. Into each tortilla place some onion, pepper, chicken and grated cheese (keep half the cheese to top the whole lot at the end). 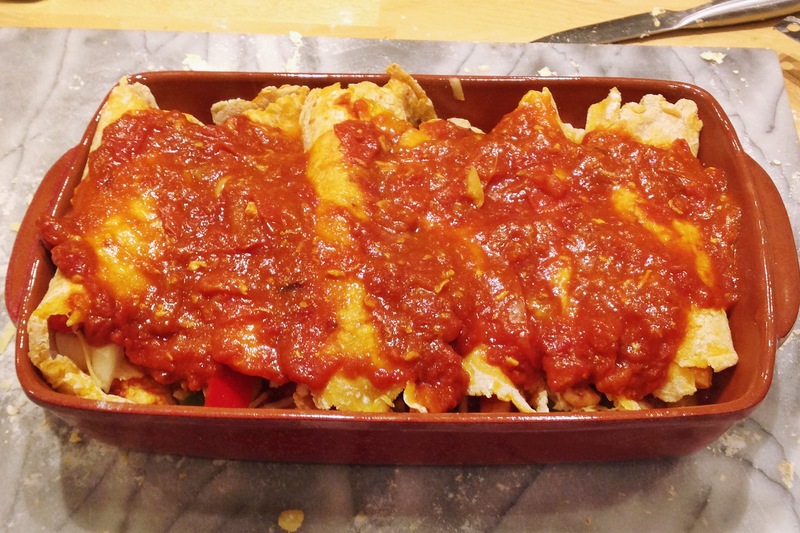 Roll the tortilla up and place it in the sauce-lined dish. Repeat for the 5 remaining tortillas and then top with the remaining quarter of the sauce. Bake in the oven for 25 minutes and then top with soured cream and the remaining grated cheese and bake for a further 5-10 minutes, until the cheese has melted. Serve and enjoy! 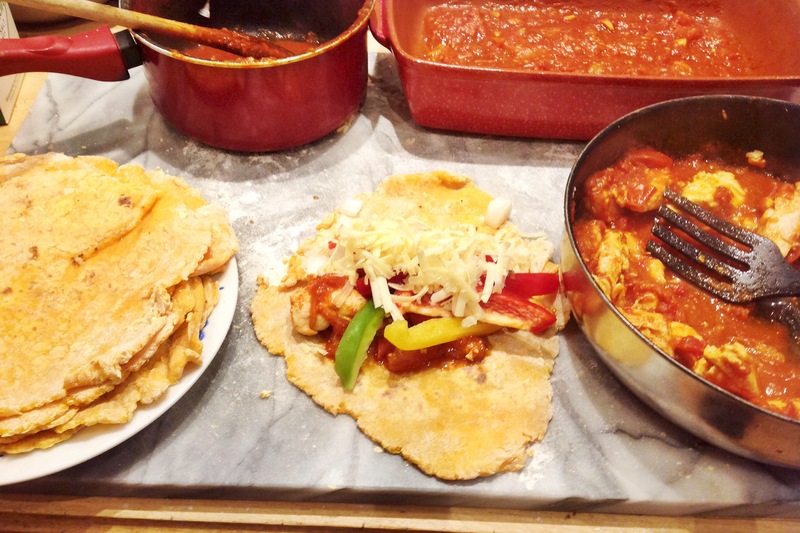 I really loved this dish and didn’t feel like it was a Mexican substitute at all, the tortillas were tasty and doughy and there were lots of lovely flavours going on. 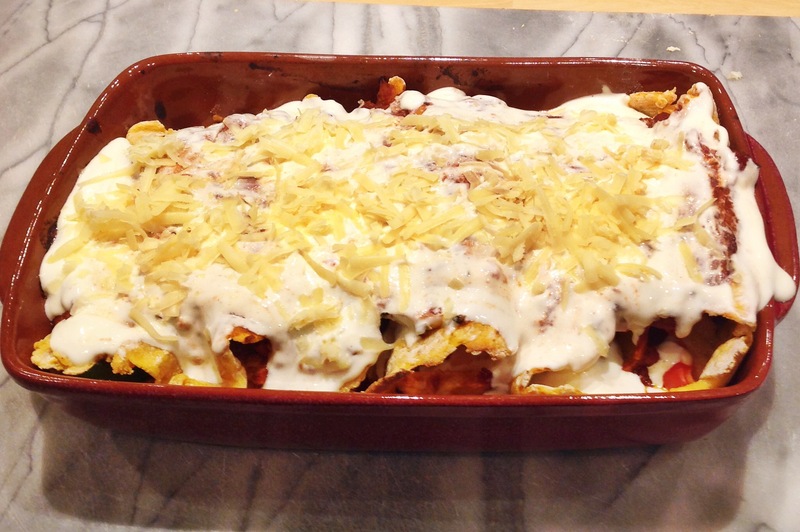 I hope you like it too; it has inspired me to attempt to make gluten-free lasagne. I’ll keep you posted. This isn’t a quick meal but it isn’t very complicated either, it just requires a little patience. I recently changed my diet to paleo and on less strict days, just gluten free. I found gluten was really affecting my blood sugar and have felt much better since cutting it out of my diet. However, there are things I miss; I love bread and pasta and I was recently pondering what I missed most and decided that I was craving Mexican, but tortilla wraps were out of the question. I then remembered that there are recipes out there for sweet potato pizza and therefore it must be possible to make tortillas out of sweet potato, too. I set about making this dream a reality. WOW. LOOKS INVOLVED BUT GOOD.